Although we no longer plant a big vegetable garden, most years we still grow potatoes, carrots, and sometimes beets (because my husband loves borscht), but ALWAYS cucumbers and tomatoes. As long as I have my cucumbers and tomatoes in the garden, I'm happy! And this year, that's all we got planted....well, except Daniel's pumpkin...I'll tell you about that another time. Our cucumbers are a little late this year, but we've been able to pick a couple of times. We have lots of green tomatoes, but it seems the gophers like them as much as I do....as soon as one ripens they are out there enjoying a feast! I had been craving a particular meal that I'd learned to make years ago, from some Arabic friends who had moved to Canada from Israel....Rice and Lentils, with Cucumber and Tomato Salad. The way I made the salad is very similar to the ones I've seen online, except I don't add parsley, and most use English cucumbers....and I didn't plant any! Don't these cucumbers and tomatoes look delicious just the way they are? This salad is served with rice and lentils, that are garnished with fried onions. Add lentils and spices to water and bring to boil, then simmer until tender; about 30 minutes. Add rice (and more water if required) and cover. Cook on low/med about 30 minutes. Serve garnished with fried onions, and salad. Cucumber and tomato salad, served with rice and lentils, garnished with fried onions. Delicious! Have you tried this dish or something similar? Let me know. Thanks for stopping by! I think it all looks delicious, plus your garden is beautiful. That salad looks so healthy! besides looking great to eat! Thanks Kim! The whole meal was delicious...but I ate too much! This looks amazing! I never cook with lentils, I'm not sure why...I love cucumber tomato salad though! Heather, This is really the only dish I make with lentils, and they taste great with the rice, but so much better with the salad! Thanks, Christie. Next time you visit, you have to stick around long enough to make us some Cauliflower Chicken again! Oh man.... this looks so good! I love the cucumber and tomato salad! 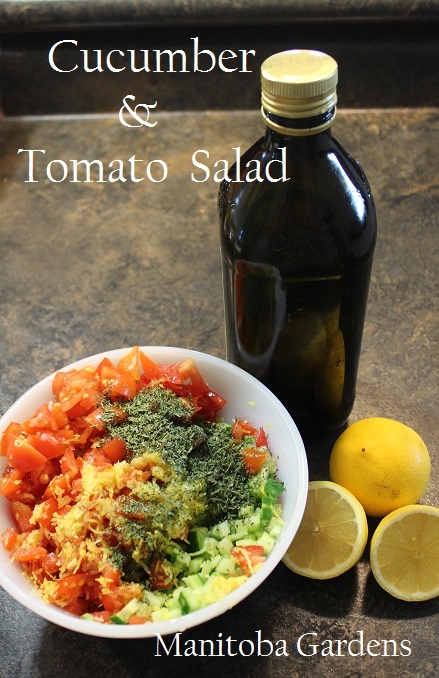 The salad is delicious, but even better served with the rice and lentils! Hahaha, Laura, I'm sure he'll appreciates it! Emily, That is the best way to serve this salad...it's sooo delicious!